We live in a peer-to-peer world. We spread ideas with our friends through Facebook. We browse for the best restaurants on Yelp. We find new music to follow on Spotify. Over the last decade, peer-to-peer has started to permeate every aspect of our lives. 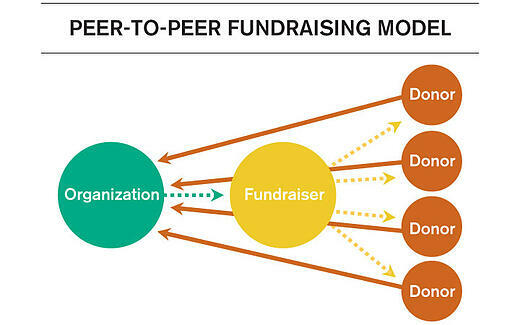 Peer-to-peer (P2P) fundraising is one of the fastest-growing and most exciting nonprofit fundraising channels. Whether it is serving as the foundation for massive event programs, the mechanism underneath innovative cause marketing efforts, the viral engine for digital campaigns, or the basis of good old-fashioned networking, P2P is transforming the fundraising landscape. At Plenty we believe that abundance is out there, waiting to be unlocked – and more than ever, nonprofits are using P2P techniques to unlock it. You can use it to grow your program and achieve your goals, yes – but you can do so much more on top of that. A cure can be found. Hunger can be erased. The earth can flourish again. Your mission can be fulfilled. Our team has studied and developed peer-to-peer techniques for nearly twenty years through our work helping organizations harness the power of networks to fulfill their missions. As we have learned what works – and sometimes, what doesn’t – we have developed a set of models and tools that help us describe the methods of peer-to-peer. The first step in unlocking the potential of peer-to-peer fundraising is to understand the countless amount of ways P2P takes shape. The Family Tree of Peer-to-Peer Fundraising below highlights some of the most common – and best examples – of the peer-to-peer methodology at work. 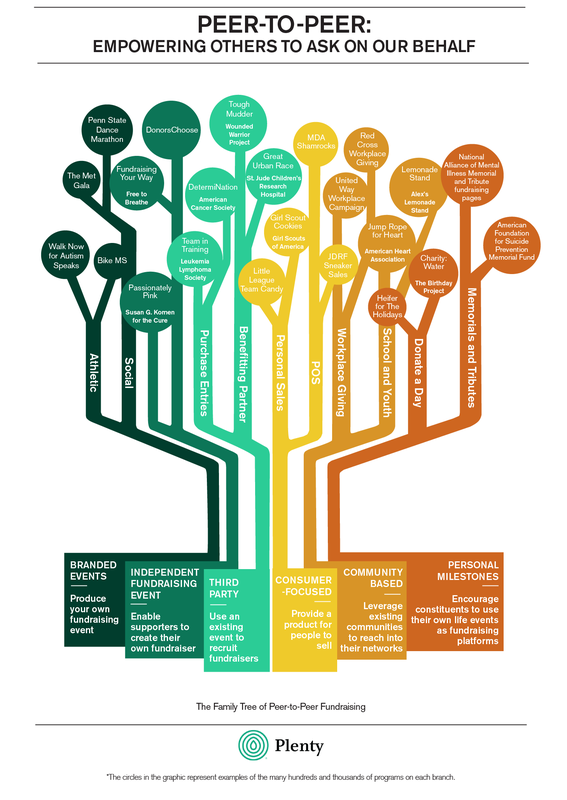 Download The Family Tree of Peer-to-Peer Fundraising. Whether you’re a nonprofit novice or a seasoned professional, you’re probably familiar with the idea of peer-to-peer fundraising – but most of the people we work with aren’t quite sure how to explain it. Think about the difference between how your organization fundraises and how your constituents fundraise. Traditional fundraising involves reaching out to people connected to us, whereas peer-to-peer fundraising involves asking constituents to reach out to people connected to them. That’s peer-to-peer fundraising in a nutshell: your constituents reaching out to their networks on behalf of your cause. In traditional fundraising, organizations have a direct relationship with their donors. Organizations ask for contributions, and donors respond by donating to the cause. Because of this one-to-one dynamic, fundraising potential is contingent upon the number of people the organization knows. As a result, the organization is limited in its ability to expand its mission. The beauty of peer-to-peer fundraising is that the organization has access not only to its constituents, but also the constituents' networks of family, friends, and coworkers. Access to these networks creates a limitless pool of potential new donors because the list of supporters isn’t limited only to the people directly connected to the organization. 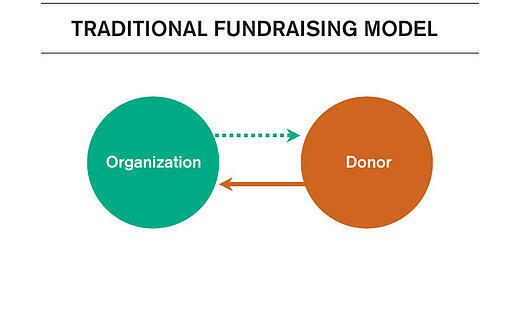 In this fundraising model, the audience is expanded exponentially. Peer-to-peer is not just about whom the organization knows – it is about whom the organization’s supporters know. At Plenty, we’ve spent years developing unmatched experience in peer-to-peer fundraising. And we’d like to show it to you. Check out our P2P services here. Download The Family Tree of Peer-to-Peer Fundraising today and share with your team!